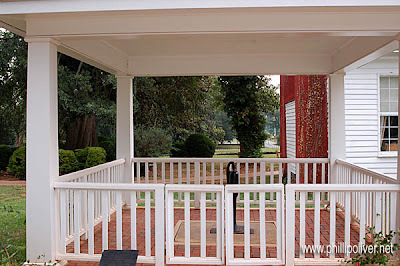 Helen Keller was born in Tuscumbia, Alabama at Ivy Green, her family home. It is within 6 miles of my house and I'm embarrassed to say that, until two weeks ago, I had only been there once and that was on a class trip when I was very young. I'm writing an article for Alabama Gardener about gardening restoration at Ivy Green and I've been engrossed in a biography on her. I've heard of Helen Keller my entire life but I never realized just how famous she was. She was especially popular overseas, where admirers mobbed her like they do rock stars. She was a fascinating woman and her achievements are quite remarkable. Try as I may, I just cannot fathom living in a world of darkness and silence. I also find the whole concept of sign language and reading lips (Helen did it by placing her fingers on a person's mouth) quite fascinating but totally perplexing. I still don't understand how Annie Sullivan could transcribe lectures by spelling it all with sign language. How did she keep up? It just baffles me! 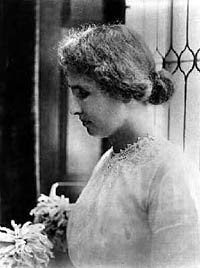 Helen Keller was born a normal child but an illness (probably scarlet fever or meningitis) at the age of nineteen months left her totally deaf and blind. 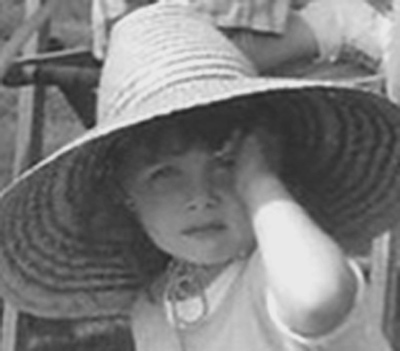 She grew up as a wild child, totally unmanageable by her bewildered and helpless parents. An article in a magazine led Helen's mother to contact the Perkins Institute for the Blind for assistance. They sent Annie Sullivan, a young woman who had just recently graduated and was partially blind herself, to Tuscumbia to teach Helen sign language. With Sullivan's skills, Helen's remarkable transformation from an unruly child into a poised and intelligent woman made both of them world famous. 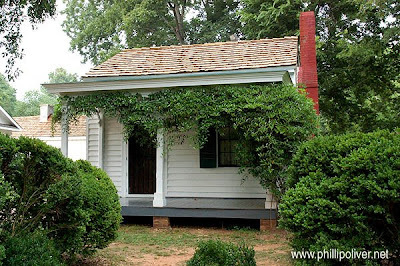 Helen Keller's birthplace, Ivy Green, so-called because the house and trees were clothed in blankets of ivy, is a tiny white clapboard house with an adjoining cottage and a few outbuildings. 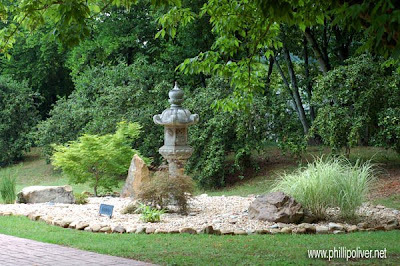 The surrounding 600+ acres were lush and filled with trees, shrubs and gardens that Helen's mother lovingly tended. Her mother adored roses and it was said that hers rivaled any you would find outside a glass house. She grew them on arches and all around the house. 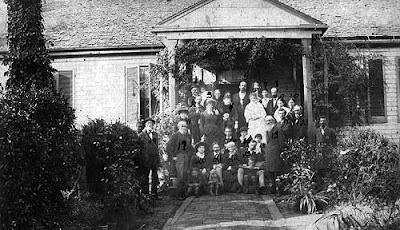 An old family photo (taken after Helen was an adult) gives you a sense of what the property looked like. Helen was actually born in this tiny cottage which sits about 30 yards from the main house. Nature was very important to Helen Keller - she grew up playing in the garden and the woods around her home - she learned the scents of plants and the way they felt - later Annie Sullivan would teach her the names of them. Flowers and plants would continue to be a source of intense pleasure throughout her life. One of her favorite places to play at Ivy Green was inside this boxwood circle. Recently, the volunteers have added a bench and planted 'Annabelle' hydrangeas. 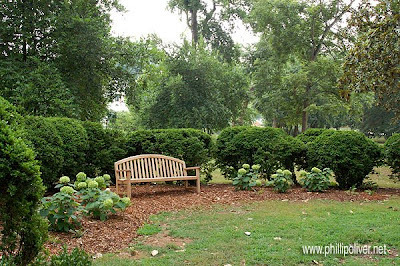 In 1954, when Ivy Green was donated to the National Registry of Historic Places, most of the garden had vanished. Massive mature magnolias, boxwoods and other trees still dotted the landscape but the roses and other shrubs and flowers were gone. The city of Tuscumbia took care of the grounds and this mainly consisted of mowing the grass. 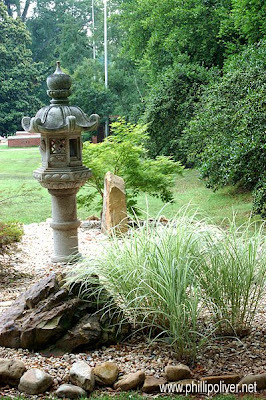 Thanks to the Shoals Master Gardeners, the Shoals Beautification Alliance, Men's Garden Club and various other local organizations, efforts are now underway to renovate the gardens. It is not a historically accurate recreation but rather creating areas with plants that Helen wrote about in her works and plants that are tactile and fragrant. The fountain area has been recently renovated. 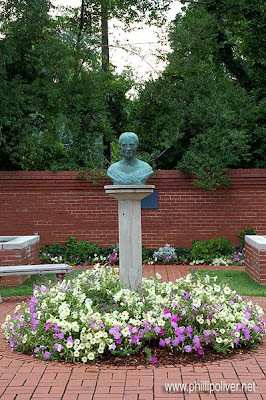 Ragged nandinas around this bust of Helen Keller were replaced with colorful petunias. A small Japanese garden has been added. Helen Keller made several trips to Japan. The concrete lantern is a gift from that country. The famous pump where the "miracle" occurred - Annie Sullivan taught Helen her first word - "water"
More plans are in the works. An herb garden, a butterfly garden and a rose garden (I may be helping with that) are just some of the enhancements that are coming to Ivy Green. For more information about Helen Keller and Ivy Green, visit their website. It amazes me that she was even able to learn to communicate. That in itself, to me, is a miracle. Fascinating story. I did not know there was such a garden connection. Thanks! What a wonderful story of her life. I didn't realize that there were gardens involved either. That is lovely that they have made her birthplace a historical monument and are restoring the gardens. I didn't know what her accomplishments were other than being tamed. You have given me incentive to seek out a biography of her and I will be looking forward to more about her gardens restoration. I hope you keep us up to date. fabulous phillip...It completely escaped me that she was from Alabama! Garden restoration is an interesting topic. What period of a gardens long life to restore, how static to make it and how much do we acknowledge that all gardens mature. I look forward to the article. Years ago, when I taught The Miracle Worker, I did some background research of Helen Keller as an intro to the play. I saw pictures of Ivy Green as it used to be. Seeing pictures of how they have restored the gardens is very nice. They seem to have done a great job in helping keep Helen Keller's memory and accomplishments alive. My grandmother always said we were related to Helen Keller. I tried to trace it once but was never able to. She was a fantastic woman. That movie just gave me the chills. How brillian she was. The state quarter for Alabama has Helen Keller as part of the design, but I didn't know the house was a site that could be visited. Besides being a historical site - it's very pretty and appealing just as a house...can't resist that style and the brick walk! I collect the state quarters (3 to go for a complete book) so I knew Helen was from Alabama. Just assumed the house was an Alabama tourist stop but never knew about the gardens. Am glad to hear this treasure is on the Registry and forgotten gardens restored. Very interesting Phillip! What a great piece, Phillip. Will you post a link to your article once it comes out? Great post on a great Alabamian, Philip. When I was young our next door neighbor taught at the Helen Keller Institute of the Blind in Tuskegee and one weekend she took me on a tour of the Institute and Helen's home as well. I thought that the Miracle Worker captured the story of her life very well. The story of Helen's teacher Anne Sullivan is also very touching. I had no idea that Helen Keller's house still existed, but it shouldn't surprise me, considering that she was such a celebrity in her time. And judging from the comments on this post, it seems like I need to rent The Miracle Worker! I'm glad that the gardens are being restored. The current front yard just looks so barren and depressing compared to the old pictures with vines and greenery everywhere. Out of curiosity, is there any special emphasis being placed on making the new gardens accessible to the disabled, or using plants that blind people can experience-- scent, texture, etc? Great post and with my love of history, just right down my alley. I would love to visit "Ivy Green" one of these days. Years ago I took my Girl Scout troop to see 'The Miracle Worker' on the grounds - and for the first time I realized just how Mrs. Keller must have felt when she realized that her daughter couldn't hear her. Amateurs or not, it was very moving. It's a lovely place to visit, very quiet and very Southern. Very nice post. I always knew gardening kind of brought Helen around (or so I heard). And now I know why, her mother was a gardener! Don't be embarrassed about not visiting, it happens to all of us in our own locations. Don't feel bad about living near historical sites and not having visited; we're 15 minutes from Colonial Williamsburg, and although we do a lot of walking up and down Duke of Gloucester St., I haven't been inside most of the buildings since the third grade! Would love to read your article when it comes out. Never heard of her! But interesting to read your post about her. I loved seeing pictures of your interesting garden Philip! I can not believe the size of your Buff Beauty! I also like all your climbers and ramblers on structures and pergolas. I have some blind neighbours and I tell you a lawnmover can be cruel to bulbs and perennials! I have helped them choose some very fragrant plants like Mock Orange, A few honeysuckles and the thornless zephirine Drouhin, since they Like Helen Keller really appreciate the fragrance of these plants. 'The Miracle Worker' was and is a classic. 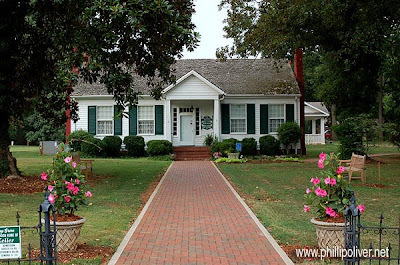 Helen Keller and Anne Sullivan were fascinating people and the Alabama home is charming. I love that Helen's Mom was a rose lover. Thanks for this glimpse into their world. Thanks for the tour, Phillip. I think one of the first books I read was a biography on her.She is an inspiration to me, so I love seeing her home. Don't you love those old boxwoods! Helen Keller was an author and wrote about 14 books I think. You can see some of her books displayed at her birthplace.